Here’s again a simple but very practical tuning case taken from a real life running system. It started by a client complaint about a product inserting process that started to take a considerable amount of time (60 seconds per product). According to the client, it was not performing so badly a couple of days ago. And, this is sufficiently rare to be worthy of a note, the client supplied the sql_id of the query he found to be the root cause of this delay. In the next section I will explain, step by step, what I did to make my client very happy. I didn’t have to search a lot. The query completes in 42 seconds of which 42 are due to the TABLE ACCESS FULL operation at line n°12. But as interesting as this RTSM report is, it has a key limitation. It doesn’t report the predicate part. And as always, the predicate information is of a crucial importance to check what filters are applied on the above full table scan. Why don’t you create a composite index on (COL1, END_DATE, START_DATE)? If we opt for the composite index (COL1, END_DATE, START_DATE) we will lose the formidable opportunity to have a very small and attractive index on COL1 since null values of COL1 will be added into the composite index. Thanks to the new index the execution time of the client critical query dropped from 42 to 0 second and the logical I/O consumption from 1 million to only 11 buffer gets per execution. Through this simple real life example I wanted to show how crucial is the first column of an index when used in an equality predicate. I wanted also to emphasize that, sometimes, and all things being equal, it might be better to prefer a single column index to cover a multi-column where clause provided this single column is very selective and contains a bunch of null values making the single index very small and thereby very attractive to the CBO. There are many posts out there explaining what a MERGE JOIN is, how it works and why it is less popular than NESTED LOOPS and HASH JOIN physical operations. 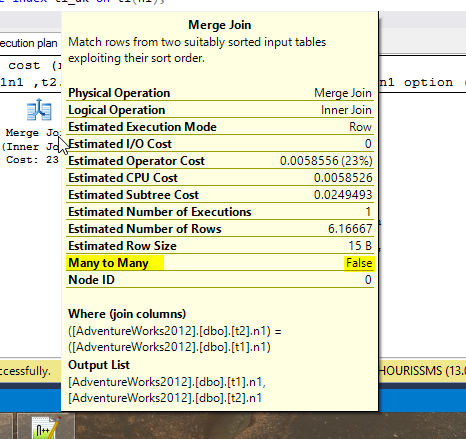 In a nutshell, MERGE JOIN compares two sets of sorted data on the merge column and outputs matched rows. It reads both data sets only once. This is why it is known as an unrelated combined operation as explained by Christian Antognini in his last book. So, we can infer that the Starts = 20 of operation at line Id n° 4 represents Oracle comparing each of the 20 join column values of T1 with their equivalent ordered join column of T2 (first rows from T1 with first row from T2 and so on until there is no more rows in T1 to compare). |   2 |   SORT JOIN         |      |      1 |    100 |     14 | -- why 14 rows? We are still generating the same number of rows, 6, but this time the operation at line id n°4 is started 14 times. Why 14 and not 100 the totality of the T2 rows? or it reaches a join value from the first input that is greater than the highest join value from the second input. If we redo the same demonstration for the case where T1 will be the driving table we will obviously find that the merge join has to go through the entire number of rows in T1 table (A-Rows = 20) because there is no join value in T1 that is greater than the largest join value in T2. In the above setup we unofficially examined a one-to-many join version of the merge join. This type of join occurs when the optimizer knows that there are no duplicate join column values in the first input data set. Although I know t1.n1 is unique I didn’t supply any such extra information like a unique index for the optimizer to opt for a one-to-many join option.This is why officially we have been using a many-to-many merge join in the preceding examples. In a one-to-many join, when two rows join, the optimizer outputs them, discards the join value from the second input (T2), gets the next join value from the first input (T1) and continue the merge process. The optimizer can safely discard the joined value from T2 because it knows that there will be no duplicate rows in T1 that will ever join with the T2 discarded row. In a many-to-many join, the merge join algorithm, very probably, keeps track of the discarded T2 row somewhere in a memory structure. If the next iteration finds that the current row is duplicated it will then compare it with the saved inmemory row. If, instead, the next row from T1 reveals to be a new one, the optimizer can then safely delete the inmemory T2 saved row. This approach can be backed up by the merge join algorithm displayed above which shows that the merge process goes always forward. It never needs to step backward in the data set. In the complex many-to-many join case this “always walk down” can be ensured by looking for a previous compared join row stored in memory and probably not by stepping backward. If an extra filter is present in the query it will be replayed back to ensure that the saved joined row satisfy the filter predicate or not. I don’t have enough experience in reading PostgreSQL execution plans but according to the actual rows generated by the second sort in the plan (rows = 14) it seems that, very probably, the query planner has used T2 table as the first input of the merge join. This is why the unique index on this table has triggered a one-to-many join while a unique index on T1 hasn’t(not show here but tested). 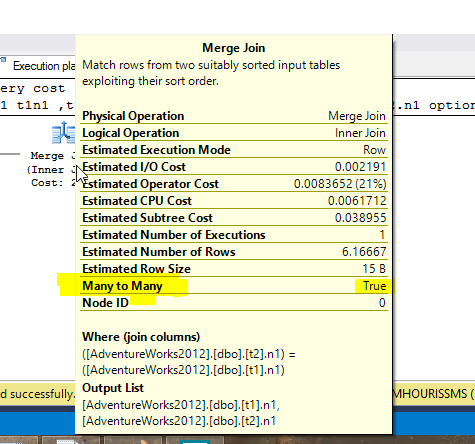 For a one-to-many merge join to occur uniquensess is required for the join column of the first input. There is no clue about the type of merge join after I have made unique the join column of the first input. However, we can observe that, thanks to the INDEX FULL SCAN operation, rows from the first input are acquired pre-sorted and don’t need the usual extra SORT JOIN operation. The Cost Based optimizer is very clever since, by switching the join order, it can declare the end of the query much earlier by stop scanning T2 as soon as it reaches the 14th row of the first input (T2) as explained above. The second point is related to the extra SORT JOIN operation at line n°3. This operation receives an already pre-sorted data set via the INDEX FULL SCAN operation at line n°4. So why Oracle needs to apply an extra SORT on an ordered data? In fact, as already explained in section 1 above, the SORT JOIN operation at line n°3, as its name doesn’t suggest, is responsible for applying the join condition (access and filter predicate n°3) on the right input for each row produced by the left input (14 rows in the current case). This is why, regardless of how the rows are acquired, the SORT JOIN operation is always needed to be applied on the right data set input. The same doesn’t apply for the first input data set where the SORT JOIN operation can be skipped whenever this data is retrieved already sorted. In this article I tried to explain how the merge join algorithm has been implemented in modern relational database systems. I demonstrated that the merge join doesn’t necessarily need to scan every row from both inputs. It stops scanning as soon as it reaches the end of either input or it reaches a join value from the first input that is greater than the highest join value from the second input. I have outlined, using MS-SQL Sever and PostgreSQL the concept of one-to-many and many-to-many join and how a unique index on the first input data set of the join can switch from a costly many-to-many to a less aggressive one-to-many form of the join.Although I have shown it here, a merge join can work with inequality join predicate and it supports outer (MERGE JOIN OUTER), semi(MERGE JOIN SEMI) and anti (MERGE JOIN ANTI) logical join operations.